According to the US Chamber of Commerce, 75% of employees steal from the workplace at least once, and half will steal repeatedly. More than likely, you – or someone on your team – will have to conduct an employee theft investigation. Save time and headaches now by following these best practices for restaurant loss prevention below. If you use a restaurant reporting and analytics tools like Delaget Guard, review and print off receipts of suspicious transactions so that you have all the details handy. This will make it easier to ask specific questions that will quickly get at the heart of the matter. A key component in your fact-finding must include written statements from the suspect(s) and potential witnesses. Statements must be written independently, dated, and signed by the employee. During the interview, take detailed notes, refer to the employee statements provided, and consider recording your conversation (be sure to ask your employees for permission to record them beforehand). Document the start and end times of your meetings, who you’re interviewing, and the specific details of the conversation. An investigation usually begins when an employee’s character or job performance is questioned. Keep the subject focused on the employee’s actions and the hard facts, and avoid talking about attitudes, beliefs, or feelings (yours or theirs). Consistently bringing the conversation back to the facts will help prevent the interview from getting derailed or emotional. Choose your words carefully, and remember that at this point you don’t know for sure whether or not your employee has stolen from you. You should also be aware that verbally telling an employee that they cannot leave the room until the interview is finished can result in a false imprisonment suit. False imprisonment doesn’t necessarily mean physical restraint – in some cases it can include psychological restraint. Keep privacy a top priority. Limit your conversation to just the employee and the investigator or manager. This will help you maintain employee confidentiality, make the setting less intimidating, and stop team member gossip. There are certain situations when having a third party involved in the restaurant loss prevention investigation is a good idea. If the employee is a female, and the manager or investigator is a male, sometimes having another woman coworker or human resources professional in the room can be helpful. In most cases, the interviewee has the right to request that a co-worker be present during the interview to help clarify specific facts. If this is the case, ask the co-worker to stand behind the interviewee and advise them to only speak up when asked a question by the investigator. 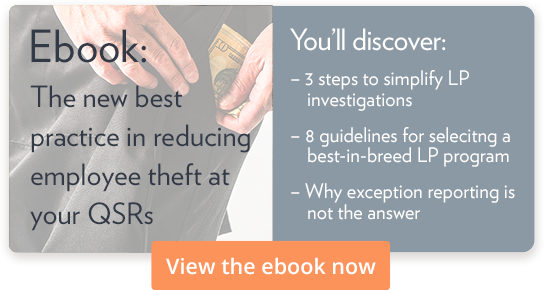 Following these four guidelines will go a long way in helping you conduct a smooth and effective loss prevention investigation. To learn how you can quickly and easily identify theft in your operation and support your loss prevention investigations with transaction-level data, reach out to a Delaget representative today.